WARNING! RICE CAN BE A SIGNIFICANT SOURCE OF DIETARY EXPOSURE TO ARSENIC | A Ventography! Arsenic has been found in some foods that use organic brown rice syrup as a sweetener, including infant formula and cereal bars, according to a new study by researchers at Dartmouth College. 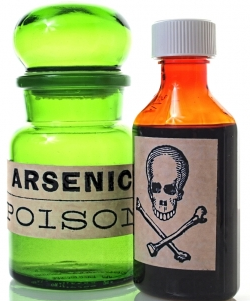 The arsenic found in the study was the type that is known to be a human carcinogen. Rice is among the plants that are unusually efficient at taking up arsenic from the soil, and much of the rice produced in the U.S. is grown on land formerly used to grow cotton, where arsenical pesticides were widely used for many years, just as they were in orchards and vineyards. A Consumer Reports’ recent investigation also found elevated levels of arsenic in apple and grape juices, further evidence that U.S. consumers are being exposed to worrisome concentrations of arsenic in foods and beverages. Another study by Dartmouth researchers published online in January 2012 found that total arsenic in some rice-fortified baby foods, such as jars containing meat-rice combinations, as well as fruit and vegetable purees for babies, ranged from less than 1 ppb up to 22 ppb, the majority of which was the carcinogenic form. The U.S. Environmental Protection Agency has set a limit for total arsenic in drinking water at 10 parts per billion (10 ppb); however, no such limit exists for food or beverages. Studies by Meharg suggest that eating about 3.5 ounces (100 grams) of uncooked rice would be the equivalent of drinking 34 ounces (1 liter) of water containing the maximum amount of arsenic allowed by the federal limit, Meharg said. Individuals who consume a lot of rice, including those on gluten-free diets, should try to add variety to their diets and check ingredient labels, as many gluten-free foods are rice-based. As the new research showed, parents can reduce young children’s dietary arsenic exposure by limiting their consumption of formula in which organic brown rice syrup is a main ingredient. Keep in mind that even seemingly small exposures to arsenic from juices, rice or rice-fortified foods add up (especially for babies, small children, and children with weak immune systems). Categories: Health | Tags: arsenic baby formula, arsenic brown rice syrup, autism, diet, gluten free casein free diet (GFCF) arsenic from rice, health, news, organic arsenic, rice arsenic dangers | Permalink. A Ventography is about: 1. Encouraging and empathizing with other parents on the autism spectrum. 2. Recycling and simplifying information on the latest autism news and health and diet tips. 3. Asking thought provoking questions designed to make us rethink what we've been told about autism. 4. Helping connect the dots that show, in some cases, autism is more than a brain disorder. 5. Challenging parents to rethink what they've been told, refuse the status quo, and escape the whirlwind of confusion. This is so scary. I’m such an “organic” pusher and while delving into GFCFSF, i am noticing the amount of rice on everything as well (especially all the pastas) – and corn for that matter. Thank you for posting this. I’ve shared this on FB & twitter and will post on my blog as well.